On Friday, the nation's attention was captured by a grim scene; a deadly shooting at a Planned Parenthood clinic in Colorado Springs, allegedly carried out by 57-year-old suspect Robert Lewis Dear. The attack left three people dead — two civilians, and one police officer — and has been condemned by countless progressives (as well as Planned Parenthood itself) as a possible act of domestic terrorism. And now, another contender for the Democratic nomination has spoken out: After the Colorado Planned Parenthood shooting, Bernie Sanders warned that "bitter" anti-abortion rhetoric can have "unintended consequences," in a tweet Saturday morning. 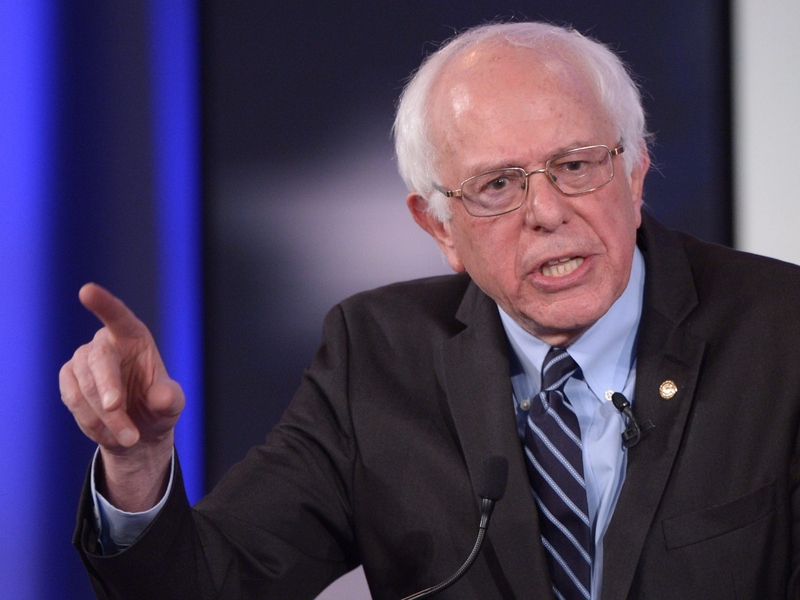 Sanders joined Democratic primary frontrunner Hillary Clinton in denouncing the shooting, and pledging his support to Planned Parenthood, but he went a step further. He also brought up the threats posed by inflammatory political rhetoric, implicitly suggesting that extreme language in the anti-abortion movement, at times echoed by candidates within the Republican Party, carries some blame for what happened at that Colorado Springs clinic. Obviously, fair-minded people can agree to disagree on how big of a role extremist dialogues play in influencing this kind of violent behavior. But Sanders is dead on in at least one regard — there's been no shortage of vehement, even violent anti-abortion commentary over the last few months. After the release of a series of anti-Planned Parenthood videos earlier this year, produced by an anti-abortion crusaders the Center for Medical Progress, the political climate has become considerably more hostile towards abortion providers — and it wasn't even safe to begin with. Presenting a number of suggestively edited, unsanctioned recordings with Planned Parenthood doctors and officials, the videos sought to demonstrate that the organization was illegally profiting from the sale of fetal tissue. The Center for Medical Progress ultimately failed to do this — though selling fetal tissue is illegal, appropriate reimbursement for transportation and storage is entirely legal — and the multiple state-level investigations that resulted have been pretty big failures in determining wrongdoing. And yet, since then, abortion providers have increasingly been on edge thanks to threats, intimidation, and yes, withering and misleading criticism from Republican candidates. In particular, former Hewlett-Packard CEO Carly Fiorina's short moment in the sun relied heavily on a baseless claim about the videos, saying they showed Planned Parenthood trying to harvest the brain tissue of a still-kicking aborted fetus. In reality, the footage she apparently watched wasn't taken by the CMP, has no clear or stated link to Planned Parenthood, and may have shown the results of a miscarriage, not an abortion. But the facts haven't really been the driving force behind the CMP's efforts, so much as trying to make average people squeamish by highlighting frank discussions by professionals about fetal tissue donation and research. Since the videos started rolling out, social media's been thick with anti-abortion sentiment, some of it deeply virulent, and centered around shared sorts of caustic buzzwords — none, perhaps, as familiar as "ghoul." In short, it's been a harrowing time for abortion providers, and that's been reflected in how they've reacted — the National Abortion Federation actually went to court with a legal complaint over death threats they'd received months ago, and their president Vicki Saporta told the Huffington Post that she hoped her group could prevent "a serious violent act" from taking place, amid all the tension. Saporta linked the CMP videos and the resulting anti-abortion climate to the Colorado Springs shooting on Friday, to The New York Daily News. There has been a direct correlation in the release of these videos and these threats. ... We were hoping to prevent it. They have been targeted by these anti-abortion extremists and unfortunately, it’s not surprising. The hate that these video have ignited have resulted in someone trying to take the law into their own hands. While Bernie Sanders, Hillary Clinton, and Martin O'Malley have all voiced their condolences and support for Planned Parenthood, it's been a whole other story on the Republican side so far — only Texas' Sen. Ted Cruz has referenced the incident so far, and he made no mention of Planned Parenthood, describing it simply as "the situation" in Colorado Springs.